(1) Louis Collins, a Republican, was elected lt. gov. of Minnesota in 1920. He got the “little corporal” nickname for his bravery in World War I. (2) Thomas Carmody, a Democrat, was elected attorney general of New York in 1910. “Little Yates” refers to Yates County, N.Y.
(3) She was the Republican nominee in Delaware in 1962. Here are some more unknown “C” candidates. I fear, though, that these may be much tougher to identify. Political Junkie March Madness is Back! 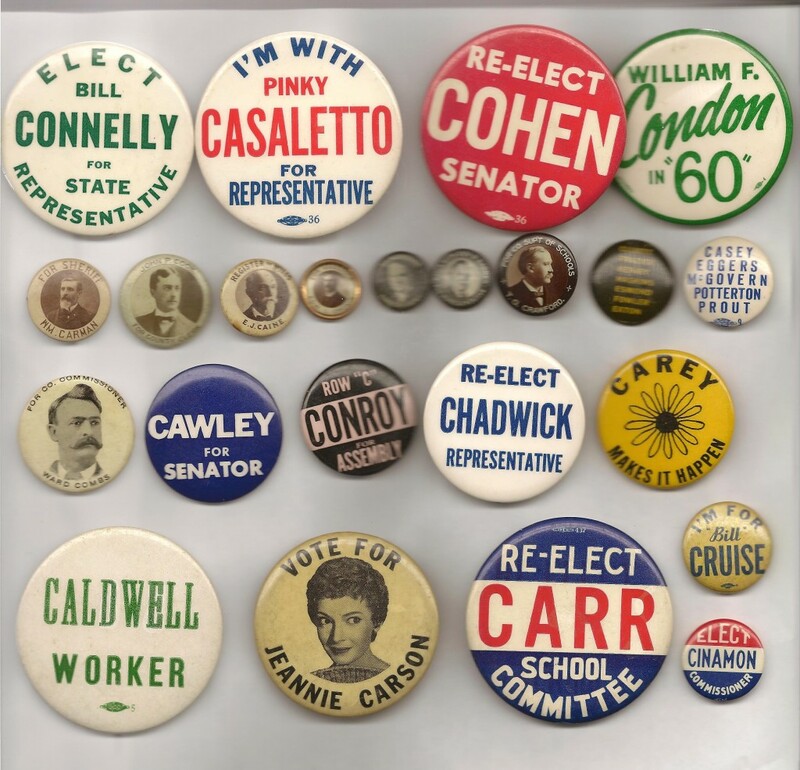 There was a William F. Condon who was in the New York State Senate from 1939 to 1954/ Could he have been trying a comeback in 1960? His Wikipedia biography has no mention of such but he would have been 63 at the time, surely not too old to try to regain his old seat. Ken, is the reason to think that the Cohen on the “Re-elect Gohen Senator is other than William Cohen? I think I got one! Ward Combs for County Commissioner appears to be Ward Combs of Billings, Missouri, running for (and winning) school commissioner of Christian County in 1898. (see Official Manual of State of Missouri, 1899-1900, p203). Mr. Combs was also principal and superintendent of schools in Billings, as well as an orchestra conductor, justice of the peace, notary public, insurance agent, and optometrist (see Missouri School Journal #39, p40 and, for picture as optometrist, http://www.findagrave.com/cgi-bin/fg.cgi?page=gr&GRid=26866333). Ken I think Re-Elect Cohen is Beryl Cohen Ma. universal badge! Sometimes confused with Maine Cohen! Casey, Eggers, McGovern, Potterton, and Prout were the losing ticket of the Frank Hague machine in the 1949 Jersey City municipal election. Frank Hague Eggers was Hague’s nephew and successor as mayor, 1947-49. The other four were incumbent city commissioners Daniel Casey, Philip McGovern, Arthyr Potterton, and John Prout. All five were swept out by the reform ticket headed by John V. Kenny (who later went to jail himself, I believe). See N.Y. Times, 5/8/49 and 5/11/49. Pinky Casaletto is my grandfather.